A poem for my (ex)? It's complicated but we broke it off as a relationship cause of how unappreciative I was for her and for how i made her feel "not good enough" so I wrote this to express the only way I know how, how special she is to me and how she truly doesn't know, just how amazing she it. 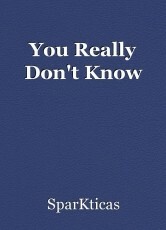 You really don't know do you? How your ears listen to me without falter. How you have changed my life for the better. © Copyright 2019 SparKticas. All rights reserved.